The college admissions process was always a stressful one; now, it’s both stressful and complicated! Applying to the top 10-15 colleges is even worse. There are so many options now within common application and slideroom and so many more essays than before. Completing a high-quality application on time has become a significant project that requires advanced planning a full year to six months ahead and a lot of thinking, strategizing, decision-making and writing. One thing that can be of immense help is to have a thorough checklist formatted as a schedule to help you stay on track. As the adage goes, “How do you eat an elephant? One bite at a time.” Use the checklist as a to-do list and post it on your door or on a project management platform (IvyZen uses basecamp to manage this list for our students). 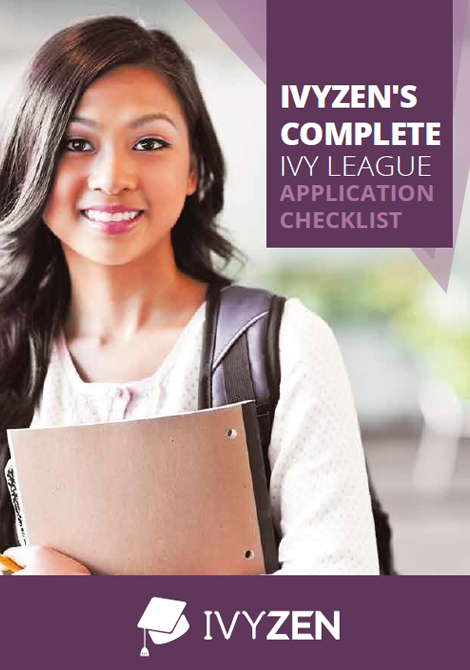 One caveat is that this list is geared towards the Ivy Leagues. The top schools are significantly different from other schools in that, on average, they require much more content. There are 2-3x the number of essays, e.g. Columbia has 4-5 150+ word essays and 2-3 short answer questions, and more opportunities for supplementary material submission, e.g. MIT allows for maker portfolios, many other top schools allow for research paper/project submissions. Also, this list is a general version of the list we use at IvyZen for our own students; each of our students usually have a customized list with several more items. But the list we present here covers all the major bases and, of course, you can work off this to add your own items. There are two parts here: an outline of all the to-do items and in-depth explanations of the to-do items. Due to the length of this article, you will have to sign-up below and download our free pdf to see the entirety of the in-depth explanations. This entire guide is 10 pages long, so we’ve created a convenient pdf that you can download for free. Download it onto your smart phone and work on it throughout the day!